"This is a very popular dish in Singapore. 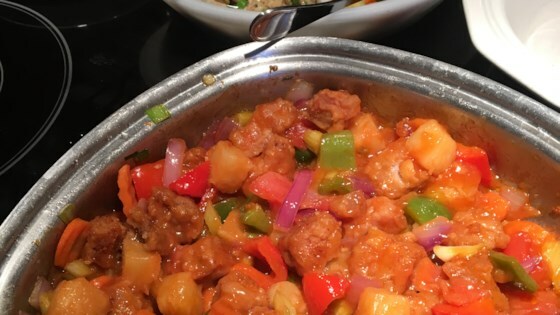 Tender pork pieces combined with peppers, tomatoes, pineapple and onion in a sweet and sour sauce. I hope you will like it." Cut the pork into 1-inch cubes. In a medium bowl, combine the salt, baking soda, and 1 tablespoon water. Whisk in the egg. Place the pork pieces in the bowl and turn to coat. Set aside while you prepare the other ingredients. Whisk the white sugar, salt, and cornstarch together in a small bowl. Stir in the vinegar, ketchup, plum sauce, and water. Place the tapioca flour in a large, resealable plastic bag. Place the pork pieces in the bag with the flour and shake the meat around until all the pieces are coated with the flour. Discard the marinade and excess tapioca flour. Heat 1 cup oil in a large skillet or wok over medium high heat. Working in batches, place the pork pieces in the oil and fry for 5 to 10 minutes, or until golden brown on all sides. Remove the pork from the oil and drain on a paper towel-lined plate. Carefully pour out the frying oil into a separate container to cool. Pour 2 tablespoons fresh cooking oil into the pan. Over medium-high heat, stir-fry the green bell pepper, red chile pepper, pineapple, onion and tomato until the vegetables are tender, about 5 minutes. Stir in the reserved sauce mixture. Bring sauce to a boil, stirring constantly, until thickened, about 3 minutes. Return pork pieces to the skillet, mix well, and serve immediately. Tapioca starch, also called tapioca flour, can be found in Asian markets and in the gluten-free section of some supermarkets. This was really great, and I am one who makes a lot of Asian food. Don't worry if you don't have tapioca starch, regular cornstarch (or sweet rice flour) works fine. total and absolute yumminess!!! just tried it tonight and was glad I made double. This is definately a 5 star or more. The dish is very tasty and you should get a award for this because it's excellent and eveyone loves it. Thanks, Jennifer!!!! !